viaLibri ~ Gentlemen and Ladies, this is to inform you that Barnabas Hewitt, chimney sweeper, resides at Bow, near the Bird in Hand . CHIMNEY SWEEP. ADVERTISING FLYER. HEWITT, Barnabas. 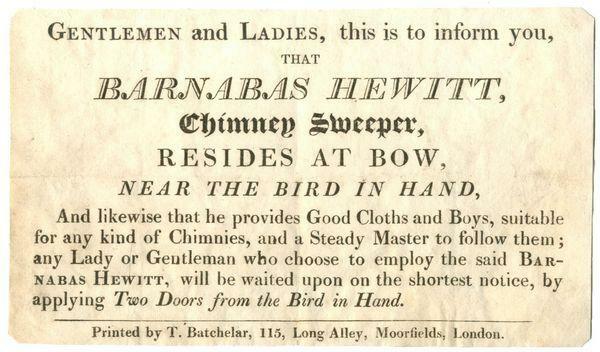 Gentlemen and Ladies, this is to inform you that Barnabas Hewitt, chimney sweeper, resides at Bow, near the Bird in Hand . Printed by T. Batchelar. [c.1820] - Printed slip on recto only of thin paper; sl. creased with one small tear to lower margin. v.g. 10 x 16.5cm. Advertising the provision of ?good clothes and boys, suitable for any kind of chimnies, and a steady master to follow them; any Lady or Gentleman who choose to employ the said Barnabas Hewitt, will be waited upon on the shortest notice, by applying two doors from the Bird in Hand? BBTI records the printer T. Batchelar as being active between 1807 and 1828. PLEASE NOTE: For customers within the UK and the EU, this item is subject to VAT.